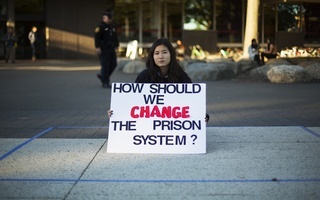 A Harvard student sits silently to protest solitary confinement in correctional facilities in April. The Harvard Organization for Prison Education and Reform held a 24-hour demonstration last week to protest solitary confinement in correctional facilities. 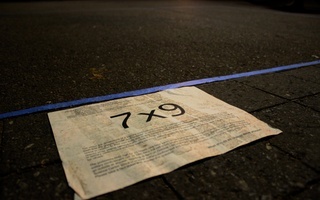 During each hour of the “7x9” protest, a volunteer sat inside a 7-foot by 9-foot box made of tape, providing a visual representation of the small area allotted to prisoners placed in solitary confinement. The vigil took place in four separate locations on Harvard’s campus and began at 4 p.m.
“Someone's sitting in the box, and they're not using their phones, they're not talking to anyone, and that's representative of how someone who has been put in solitary confinement would have—the conditions that they would face,” said Beatrice H. Farb ’21, a member of HOPE. HOPE, a group under the Phillips Brooks House Association, runs a tutoring program for currently incarcerated youth, men, and women. HOPE volunteers also advocate for prison reform. 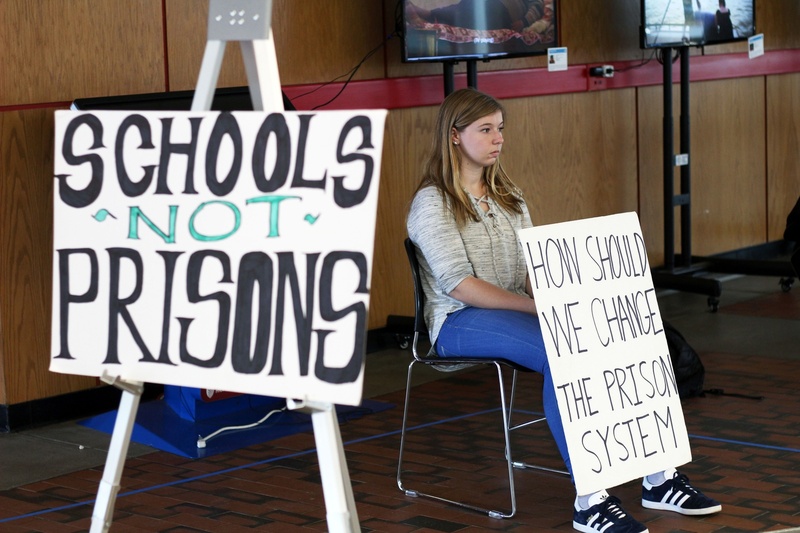 In addition to the student sitting in the box, another volunteer stood nearby throughout the demonstration in order to educate passersby about solitary confinement and to ask bystanders to sign a petition urging the creation of a prison education program taught by Harvard faculty. The proposed degree-granting program would educate incarcerated individuals alongside Harvard College students. The group previously co-sponsored a letter at a three-day event in March demanding that the University create this program for incarcerated people and lower barriers to admission for prospective Harvard students with criminal records. Leah S. Yared ’19, educational co-director of HOPE, said the organization is drafting a letter that it plans on presenting to University President-elect Lawrence S. Bacow, who will take office on July 1. Sonya A. L. Karabel ’18, another member of HOPE, also spoke about the impact she thinks a prison education program would have on incarcerated individuals and Harvard students alike. “I think that learning alongside each other is something that would have really profound educational impacts for everyone involved, and be really transformative, and also build positive social networks that I think people on both sides often don't have the chance to create,” Karabel said. HOPE also asked students to consider supporting the Massachusetts “Omnibus Criminal Justice Reform Bill,” which includes some components addressing the criteria for solitary confinement. Yared said the group also hosted an event at the College’s annual admit weekend, known as Visitas. She said HOPE held a screening of “The Prison in Twelve Landscapes,” a documentary centered on the prison industrial complex. She said the group is interested in all issues related to criminal justice reform. —Staff writer Ruth A. Hailu contributed reporting. Solitary confinement is a barbaric practice, unacceptable as a routine punishment.